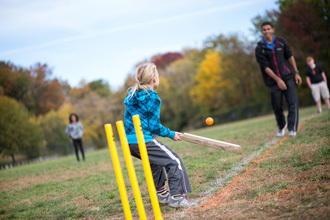 At The GreenMount School, students are given the opportunity to practice basic motor skills and learn how to play organized sports in an environment that connects the idea of physical fitness with fun. An emphasis is placed on sportsmanship, activities that provide a positive experience for the students, and an exploration of sports and games of world cultures. Students participate in age-appropriate sports and activities and learn the rules and structures for formal team sports. Cardiovascular and muscular development activities progress with the age of the student. Additional opportunities for martial arts lessons and other sports clubs are available through the ECHOES program. The GreenMount School does not field competitive sports teams.